Fourth rector of The Catholic University of America, Bishop Thomas Joseph Shahan (1857-1932) was instrumental in the creation of the National Catholic War Council, an organization founded in response to the challenges of World War I and now known as the United States Conference of Catholic Bishops (USCCB). Bishop Shahan was the child of Irish immigrants and an ardent supporter of Irish independence. 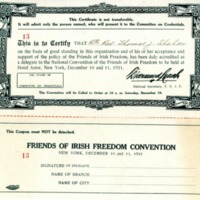 Among his papers, we find his Friends of Irish Freedom (FOIF) certificate to be a delegate at the organization’s convention of December 10th and 11th, 1921. He also saved cards commemorating two Irish martyrs who died after hunger strikes: the Easter Rebellion commandant Thomas Ashe (1885 – 1917), and the Sinn Féin Lord Mayor of Cork Terence MacSwiney (1879 - 1920). 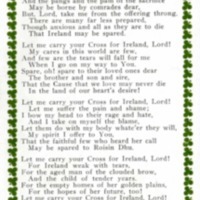 Bishop Shahan often wrote in support of Irish independence, including “The Cause of Ireland” in the December 1920 edition of The Catholic University Bulletin. 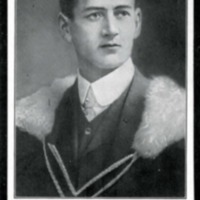 In that publication, he addresses the death of Terence MacSwiney with impassioned words: "Mayor MacSwiney will at long last take his place in the long list of martyrs of Irish independence, that great human cause for which the sons and daughters of Ireland have fought so long and to date so hopelessly." Lord-Mayor Terence MacSwiney "Resistance to Tyranny is Obedience to God"